SHOP WORRY FREE! 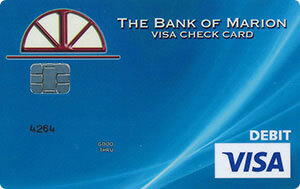 Your Bank of Marion debit card is one of the safest ways to make purchases or other transactions. 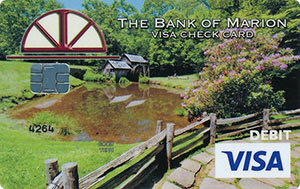 Look at the little VISA™ sign on your card. 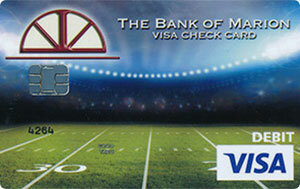 It means that your card is covered by VISA’s Zero Liability Policy! It’s your guarantee that you will not be held responsible for unauthorized charges made with your account. 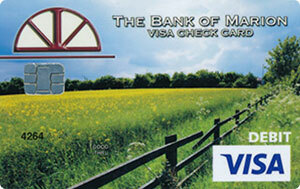 You are protected if your Visa debit card is lost, stolen or fraudulently used. 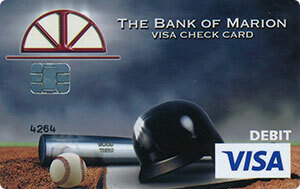 Check it out: Visa® Zero Liability Policy. 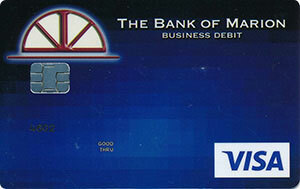 FOR MAXIMUM SECURITY, ALWAYS RUN YOUR DEBIT CARD AS CREDIT. This adds yet another layer of security. REMEMBER. NEVER GIVE OUT YOUR PIN TO ANYONE. PERIOD. NEVER GIVE OUT YOUR PIN TO ANYONE. PERIOD. Think about it this way. Why would we contact you and ask for your PIN. We assigned it to you in the first place. We have it. We certainly don’t need to ask you what it is. If someone calls you or contacts you in any other manner and asks you to share or confirm your PIN or your account number, they are crooks. Don’t help them steal your money. 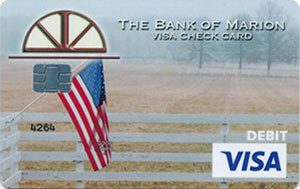 New Visa® Check Card customers receive the new chip card when they sign up. 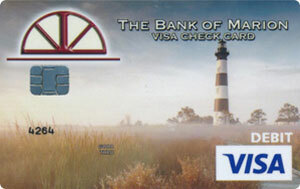 Current debit card customers will receive a new chip card upon renewal. Existing customers may get a new chip card upon request at any of our full-service branches if they don’t wish to wait for renewal. 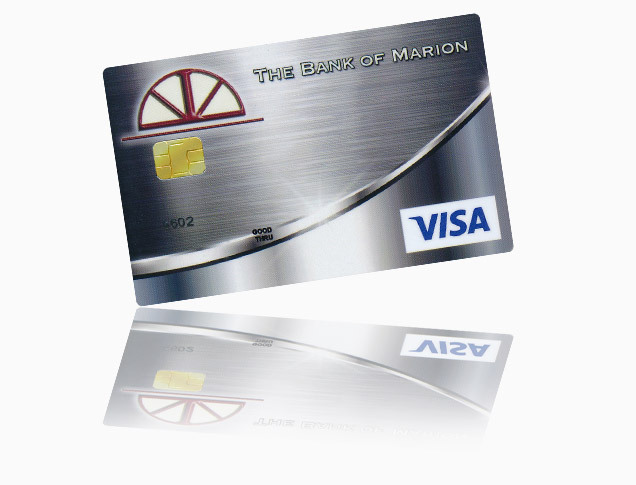 Make your new Bank of Marion Visa™ Check Card your constant companion and you'll always have instant buying power at your fingertips and cash when you need it from our ATM network. Check your credit card statement online, anytime. Note: To report a lost ATM or debit card or possible card fraud during regular banking hours, call 800.772.1807. 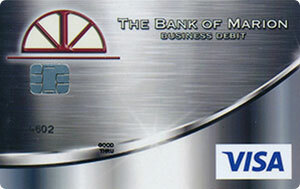 After regular banking hours, call 800.889.5280. 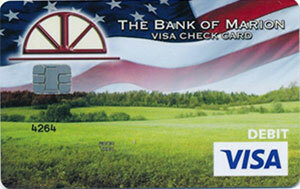 Be sure your Bank of Marion Visa Card will be available for use outside the USA. 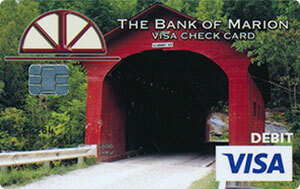 Due to fraudulent debit card transactions occurring internationally, your Visa Check Card will be blocked from signature-based transactions outside the United States. You may request that your card be excluded from this block by contacting The Bank of Marion at 1.800.772.1807 or 276.783.3116. We don't restrict international card usage at ATMs or transactions with your PIN number at merchants that accept PIN (debit) based transactions. 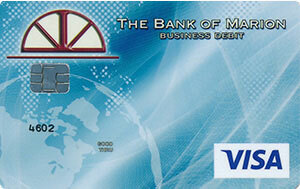 Our Visa credit cards are accepted in over 200 countries and territories worldwide by 44 million merchants. 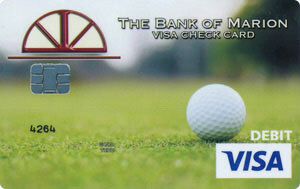 Whatever your spending habits, we offer a card to fit your needs, backed by Visa’s safe, secure and trusted network.